One part parody, one part homage, and a whole lot of referential humor. If you love only the hottest references to contemporary pop culture, look no further than the newest trailer for Magicka 2. The fine folks at Pieces International have narrowly evaded copyright infringement by putting this latest trailer, detailing the various modes of Magicka 2, into an explicit homage of one of television's most currently popular shows. To complicate matters, you've got Magicka regular Vlad singing along with his constant assertion that he is not a vampire. Fans of the series will probably regard his claims as nothing more than a bold faced lie. Oh, there's also an accordion player who seems to forget the tune mid-squeeze. Does anyone even know what's inside an accordion? I think it's best not to use the ol' squeeze box until we have a better understanding of what they are capable of. In case references don't really do much for you, we did get a look at some gameplay here. And you know what? It looks like Magicka. From the co-op combo spell casting to inevitably reducing your buddies to ash with a poorly timed chain lighting, it's more Magicka. Which, as far as I'm concerned, is a good thing. Not enough games put you and three pals in the shoes of exceptionally powerful, but completely expendable, wizards, and that's just a shame. 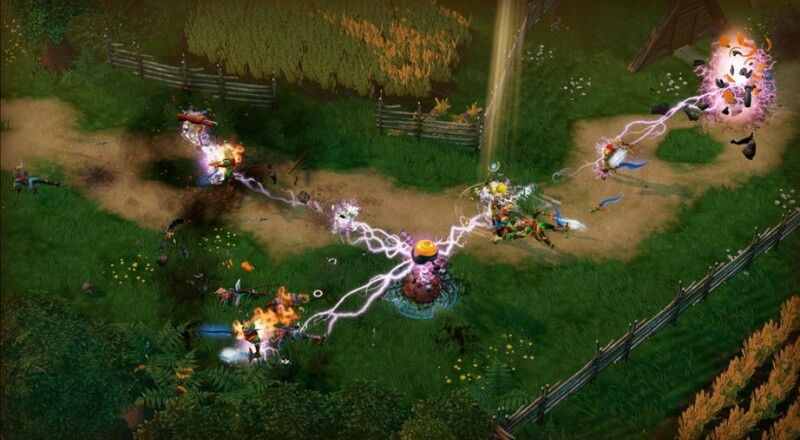 Magicka 2 launches on both PC and PS4 May 26th for $14.99.